Despite my extensive baking over this past vacation, one treat has remained absent from my diet since its last blog post long ago. I speak of course of the doughnut. Not being a food that lends itself to easy home-creation or that can be found in its highest quality in most non-doughnut specific stores, I rarely get the opportunity to have a true, quality, dare I say artisanal doughnut. I can think of exactly three shops that have brought me such a doughnut in the past year. One is a tiny shop in Great Barrington, MA by the name of Home Sweet Home Doughnut Shoppe that I found this summer on a day of free exploration, another I have discussed in some of this blogs earliest explorations at The Doughnut Plant. The third bears a similar name as the last but distinctly different vibe and product experience: The Doughnut Project. My visit to The Doughnut Project was prompted by my good friend Taylor’s visit to NYC on a beautiful sunny Saturday. Not quite the sweet savant I have groomed myself to be, I was in search for a location on my Sweet Treat Master List that would be an adventure yet not out-sugar us. Upon Taylor’s mention of honey buns, doughnuts came into my mind, and it was doughnuts we would have. We ventured up to the west 4th area and basked in the glow of the sun and the brilliant brownstones that line the blocks of this gentrified hamlet. As we veered left onto the street that housed the desired destination, we saw the doughnut-emblazoned sign with a glowing halo from the sun pointing us toward sweet treat salvation. Through the door we found a small interior that made up for its lack of space with mounds and mounds of character. The walls were bursting with life at every inch, with bright graffiti-style art, and music that continuously came through with classic bops, jams, and dare I say bangers that make it impossible not to smile and sing along (as we did a few times). But the real objects of our affection were laid out simply in front of us. Large, puffy, and pillow-like, the doughnuts were picture perfect. This was not true only of the doughnuts left out for display, but also of the trays full of doughnuts behind the counter. Not a single one looked like it had deteriorated with time, but all maintained a beautiful sheen from their various glazes. Speaking of glazes, let’s discuss their flavor options. The two of us got four doughnuts in total, ya know, for the sake of science. I got The Bronx (an olive oil and black pepper doughnut that was recommended by the cashier as their favorite), and the Maple Bacon Bar, while Taylor got the classic glaze and the Black Gold/Brownie Batter. But boy oh boy did we have a hard time deciding. Amongst the other flavors available are miso caramel with peanut brittle, chandonut rosé, “Those Beetz are Dope” (beet glaze with ricotta whip filling), The Everything (cream cheese glaze all the classic bagel toppings, PBJ, Lemon Love Letter, and milk chocolate with port wine and biscotti. Every single one looked absolutely stunning and sounded delicious to our hungry selves. But we felt good about our variety of selections and took a seat at the counter by the window and gazed in awe as the soft mid-day light shone upon the smooth glaze of the doughnuts. They looked almost too beautiful to eat, yet we brought ourselves to do as such. I dove into The Bronx while Taylor started off with the plain glaze. I was not exactly sure what I was expecting from this savory good. This summer I tried an olive oil and basil gelato for the first time and was pleasantly surprised by how well the flavors worked, so I was hoping that this doughnut would succeed in a similar way. I must say that this was the best doughnut I have ever had in my entire life! Firstly, The Doughnut Project knows what the heck it’s doing when it comes to the dough itself. With a little give and just a little chew, this fried dough was one of substance, but light as a feather. It was serving its own flavor that was commendable on its own, with just a little sweetness and a delicious moist interior. I could have eaten this doughnut unglazed any day of the week. But. that. GLAZE. It was a thin veil of glistening sugar that did not weigh down the doughnut but hugged it in a symbiotic relationship. It easily dissolved in the mouth and offered a soft stream of savory that trickled beautifully over the sweetness of the doughnut. I did not feel like I was eating olive oil, but the flavor acted as it does when used in any savory dish. It was a supporter. It gave the doughnut a lift from simple delectability, to an elegant marriage of flavor. Just when I thought I knew all of what I was eating, I was hit with a soft push of black pepper in the back of the mouth. This did not overwhelm the thus far delicately balanced flavors, but energized them. The Bronx is a must-have. It is an experience. It is the perfect doughnut. However, there were other doughnuts to try. Having been so wowed by The Bronx, I was excited to see where the other three would take us. As I had been enraptured with my olive oil and black pepper love, Taylor had been working on the plain glaze and graciously offered me a bite. We agreed that this flavor was a perfect way to understand and appreciate the doughnut itself with a simple boost of the delicate vanilla glaze. However, for Taylor this was a lot of plain old sugar, and for me I want to explore the unique flavors offered. 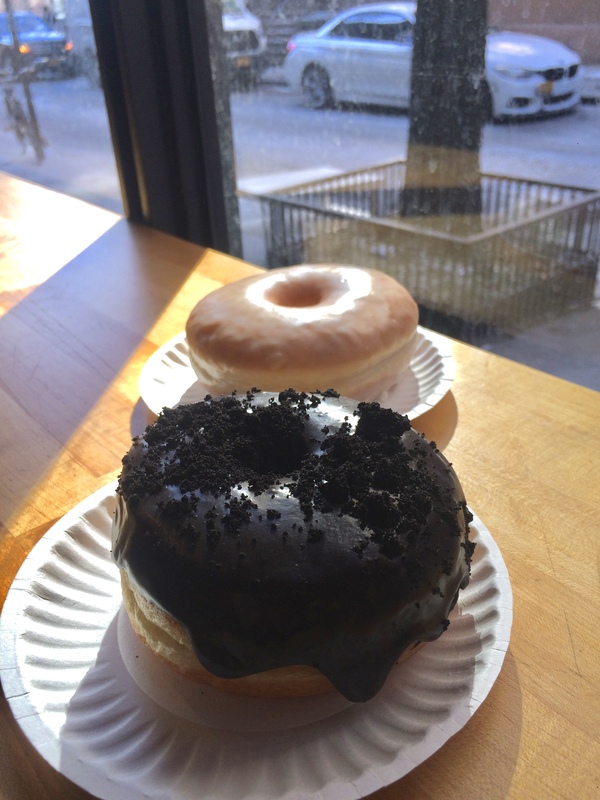 While good, I would lean more towards the adventurous side that The Doughnut Plant does so well. This is exemplified in their Bacon Maple bar. I am not one who typically goes for doughnut bars. Perhaps it is because circles are my favorite shape, or maybe I’m a sucker for the classics. Either way, I would always rather have a circular doughnut over a stick even if they’re the same flavor. But these maple bacon bars are one of the most famous products of The Doughnut Project, and having ordered three circular ones I didn’t feel like I was missing out. I have also experienced quite a palate change as of late, and become rather enamored with maple. I have gone from previously avoiding maple at all costs, not even pouring syrup on my pancakes (NH blasphemy! ), to searching for any excuses to get some maple flavor on my tongue. Bacon however, is a different story. I like bacon, sure, but I have never quite understood the bacon craze that has been present for as long as I can remember. While initially manufactured by the pork industry to sell this lesser cut of pig, bacon has truly overtaken American culture. I like it, yes. But I am never craving it. And I certainly don’t want it stuck wherever it can possibly fit itself in. In all honesty, I prefer turkey bacon over pork. In short, I’m not bacon-crazy. But the bacon was with maple, and I am a fan of salty and sweet combinations, so I had to have it. As I bit into the bar, I realized one positive element of the bar format is ease of consumption. One can easily and cleanly grip the sides and get a full bite with everything in it. And this bar made me want want more and more of those well-rounded bites. As Taylor remarked upon her own first bite, it was like a full weekend breakfast all in one bite. As I had hoped, the bacon was perfectly crispy and salty and played perfectly with the maple. The maple itself was strong enough to be a sturdy primary flavor, without sugaring me out as low quality maple goods can do. All together it was like a waffle with bacon and syrup, and all that was missing was some eggs for a full-on breakfast bonanza. It was a feeling akin to the glory of chicken and waffles. A high recommend for all you pork-eating sugar connoisseurs. Finally, we had the Black Gold. The brownie batter. The most beautiful chocolate iced doughnut that I have ever seen. This chocolate was dark and rich and truly did justice to the name black gold, for it was almost black. For some added class, there were crumbles of unknown origin sprinkled around the top that looked like bits from an extremely moist chocolate cake. However, when tasted, they were coarser and more similar to crumbles from a gourmet Oreo. This was the perfect addition of slight crunch to this decadent doughnut. When they say brownie batter, they mean it. While the flavored glaze is not layered on particularly thick, the flavor fills the mouth and one is consumed with rich, chocolatey, sea salty rich perfection. This was the cherry on top of a perfect doughnut experience. It was such a punch of perfect flavor that I was felt physically blown away, and had to take a few minutes to fully experience and appreciate what I was tasting. Taylor could not finish it in that sitting, and had it bagged for later consumption. It felt like the kind of doughnut that could be served on silver trays at a gala or birthday party of a millionaire. It was the most upscale doughnut I have ever had. We left The Doughnut Project that day feeling perfectly full in the stomach and full of joy. Throughout the day I was continuously hit with waves of wow. My mouth would suddenly remember an outstanding bite of one of the doughnuts and I would need to take a second to revel in the perfect memory. To me, this is the mark of outstanding food. Food that stays with you not only minutes after, with flavors swimming around the mouth, but hours or even days after. Food that your mind cannot let go of because it’s experience was so glorious. These doughnuts from The Doughnut Project are such a food. As I write this it is four days later, and I am still finding myself deep in thought about each doughnut and the unique gifts that they give. These are the doughnuts we should all be able to have when we’re craving some doughnuts on a Sunday morning. These are the pinnacle of quality. These are my new favorite doughnuts.